Above: Curtain Bluff Beach, home to the Curtain Bluff Resort. 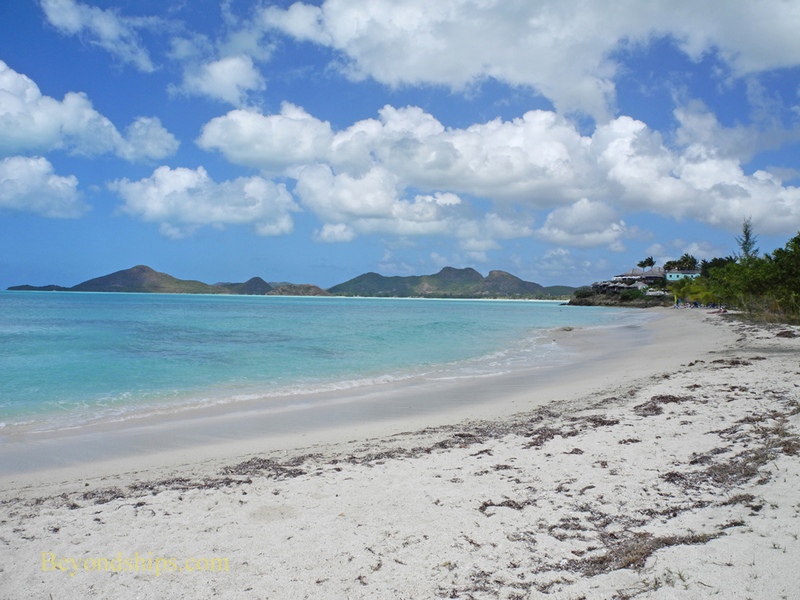 Antigua proudly claims to have a beach for every day of the year and it may well be true. 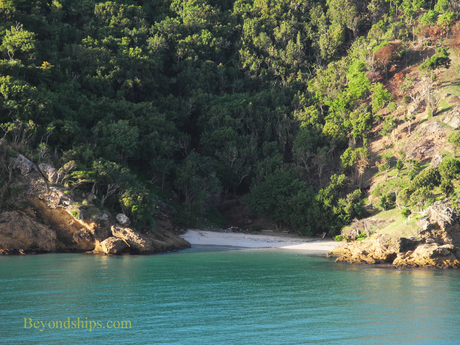 Seemingly, all along the island's coastline the land meets the water in gentle slopes of white sand. Many of these beaches have been developed and have restaurants and/or resort hotels nearby. However, many others are essentially undeveloped. 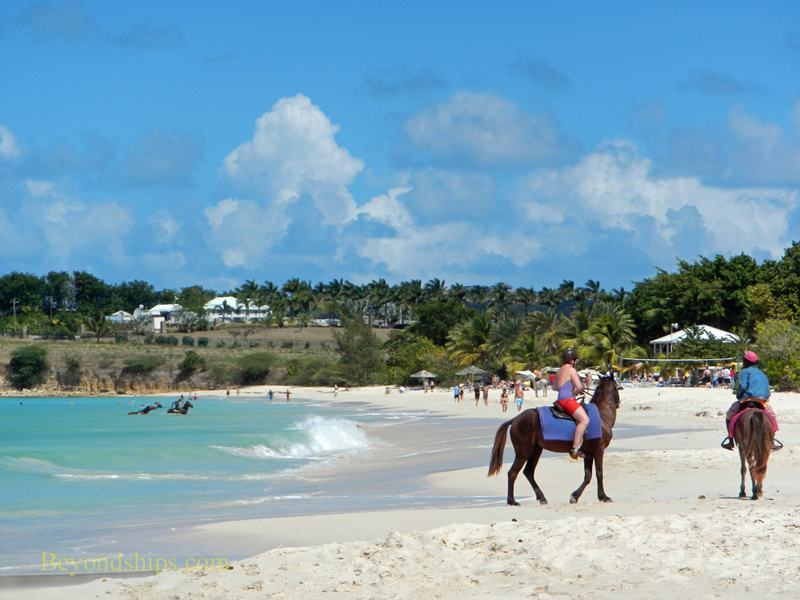 The most popular of the beaches lie along the island's Caribbean coast. The turbulent Atlantic tends to make the beaches along the east coast less tranquil. 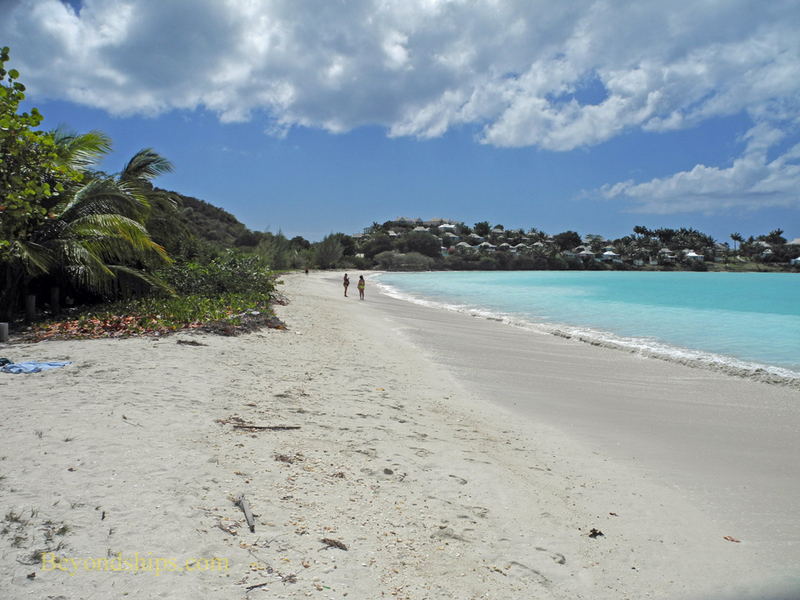 In addition, the Caribbean beaches are closer to St. John's and Antigua's cruise port. 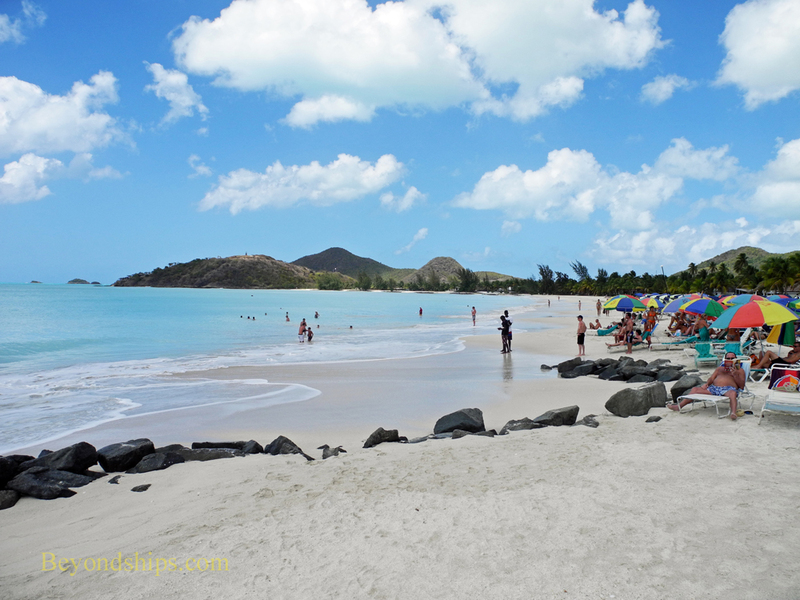 All beaches in Antigua are open to the public. 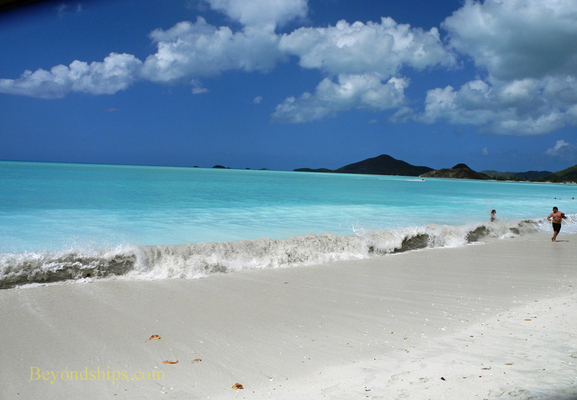 On this page, we present some examples of Antigua's beaches. 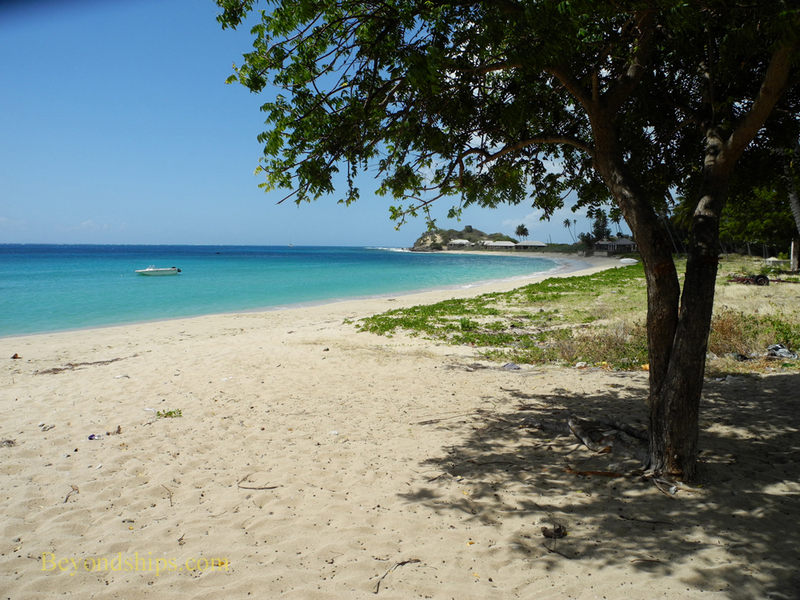 Taxi drivers frequently take cruise passengers to Darkwood Beach. It is a long stretch of relatively undeveloped beach with a bar and concessionaires at the southern end. White sand and turquoise waters make it quite pretty. However, there is little natural shade and no public restrooms. 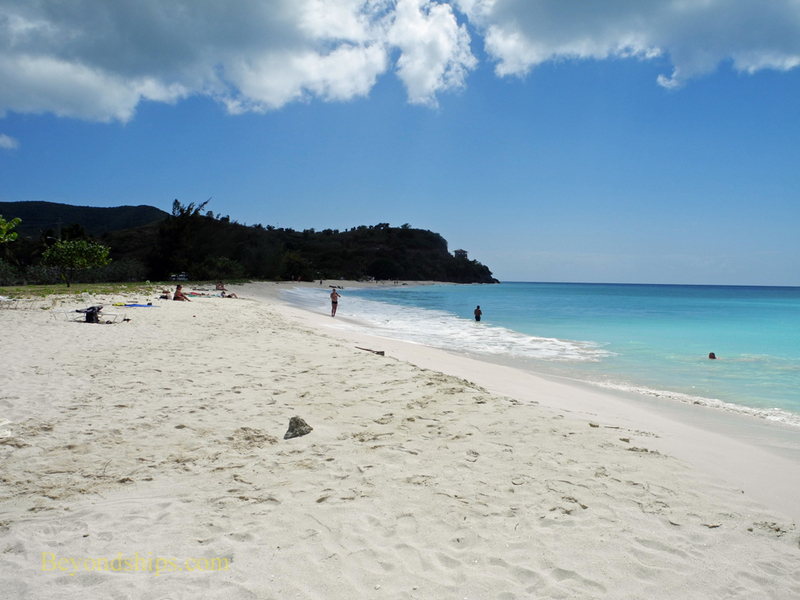 Fryes is another relatively undeveloped and quiet beach. It has a bar at one end but no public facilities. On the other side of the point that juts out into the sea at the north end of the beach is another beach, which locals call Small (or Little) Fryes (below). 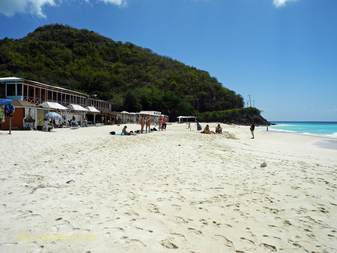 On the outskirts of St. John's, Fort James Beach is only a 5 to 10 minute taxi drive from the cruise port. Consequently, it attracts many cruise visitors as well as locals. 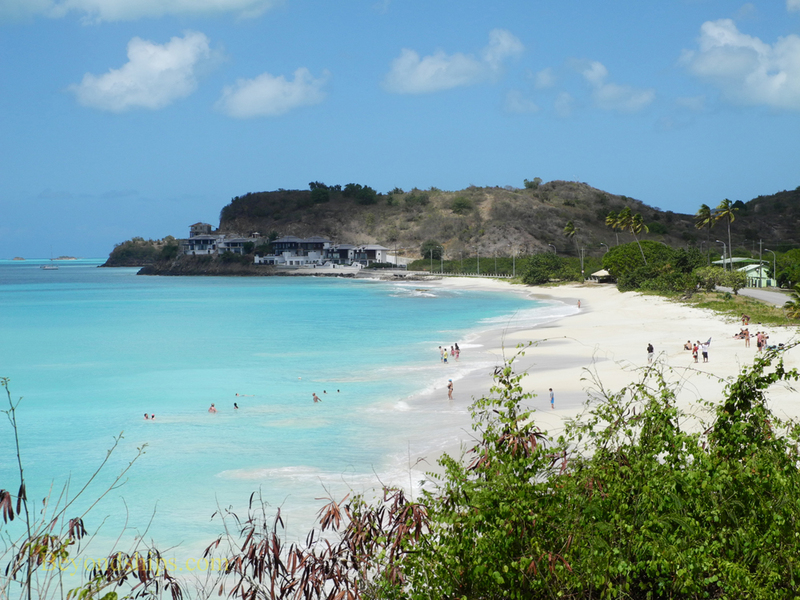 It is not the prettiest of Antigua's beaches but it has a wide expanse of white sand and a number of nearby restaurants. Umbrellas and chairs can be rented from a concessionaire. 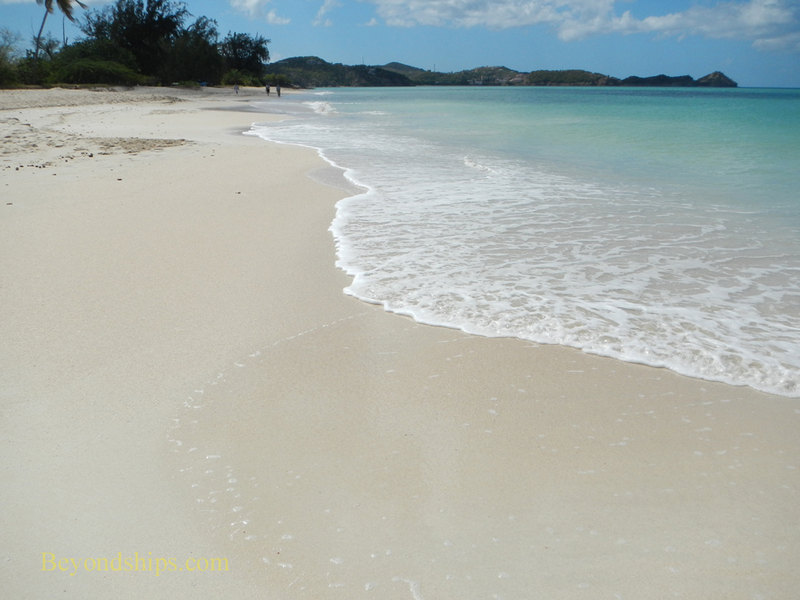 This mile-long, white-sand beach is the beach for the de luxe Jolly Harbour resort area. Nearby are restaurants, bars, hotels and facilities for watersports. As a result, this is a popular beach. 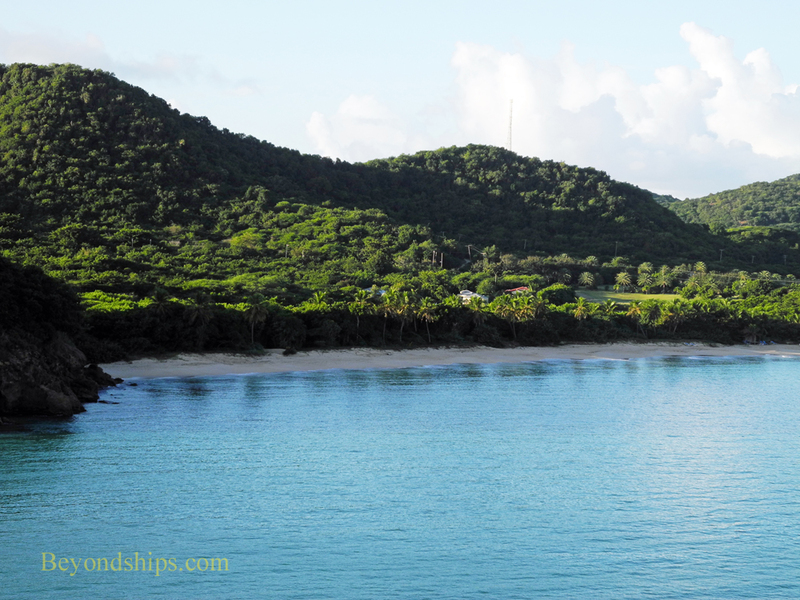 Located on the other side of a small peninsula from Curtain Bluff is Morris Bay. 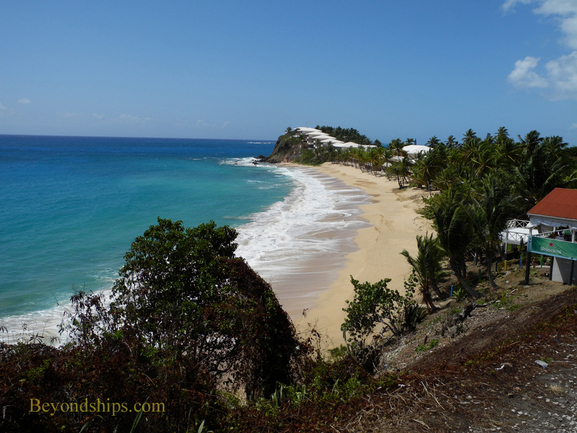 Part of this beach is used by the Curtain Bluff Resort but a substantial part of it is relatively deserted. The water is clear and there is shade provided by the coconut plams that border the beach. No public restrooms. 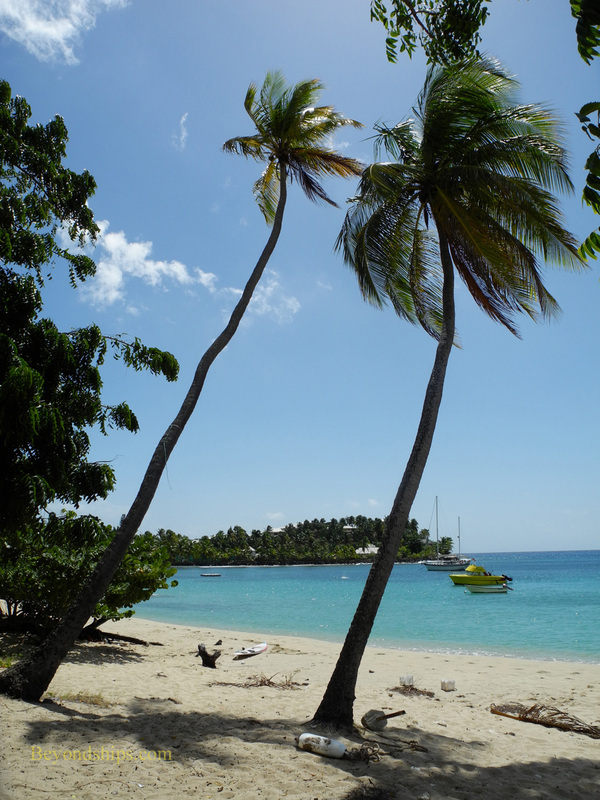 Another beach frequented by cruise passengers is Turner's Beach (also called Crab Hill Bay Beach). However, it is a long wide beach and so you do not have to be part of a crowd. 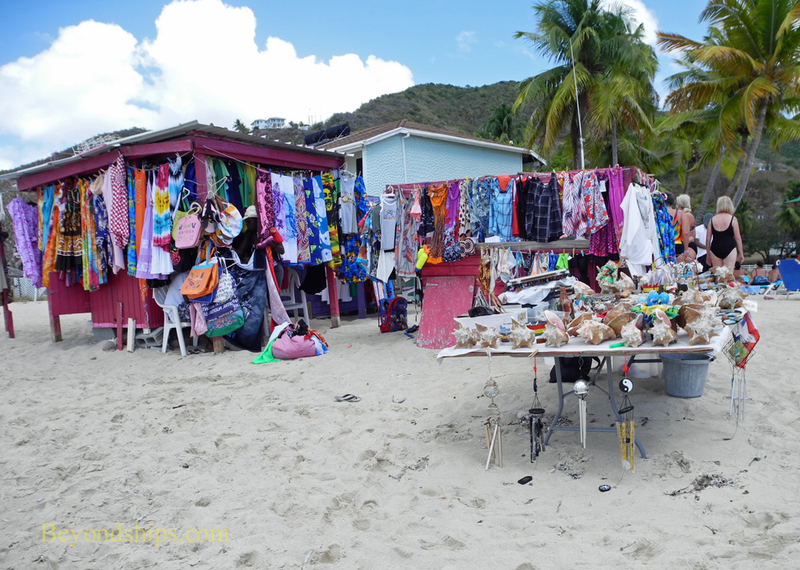 The beach has nearby bars and restaurants and vendors set up shop on or near the beach. 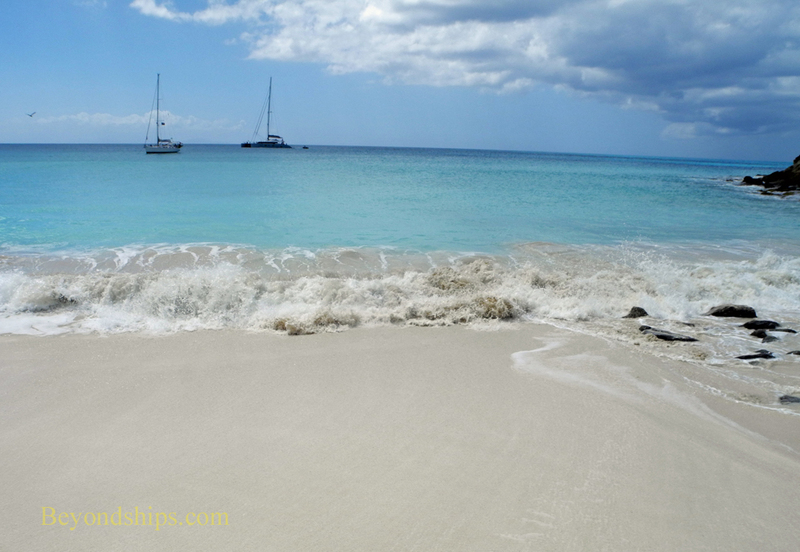 The waters off Valley Church Beach can have the most unique pale blue color that harmonizes nicely with its white sand. There is a restaurant nearby. 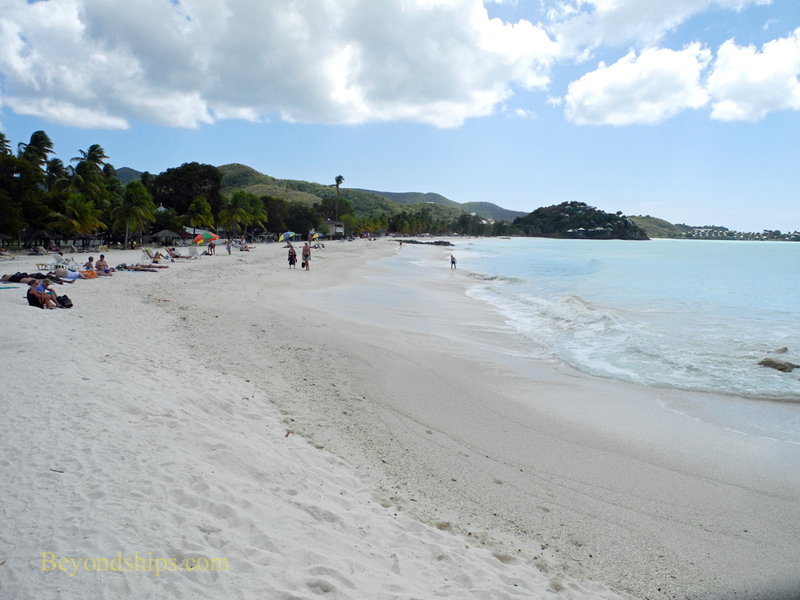 As noted above, there are many other beaches in Antigua. For example, on the eastern coast, there is Long Bay Beach, which is protected from the Atlantic by a reef, and the pink-sand Half Moon Bay Beach, a national park. 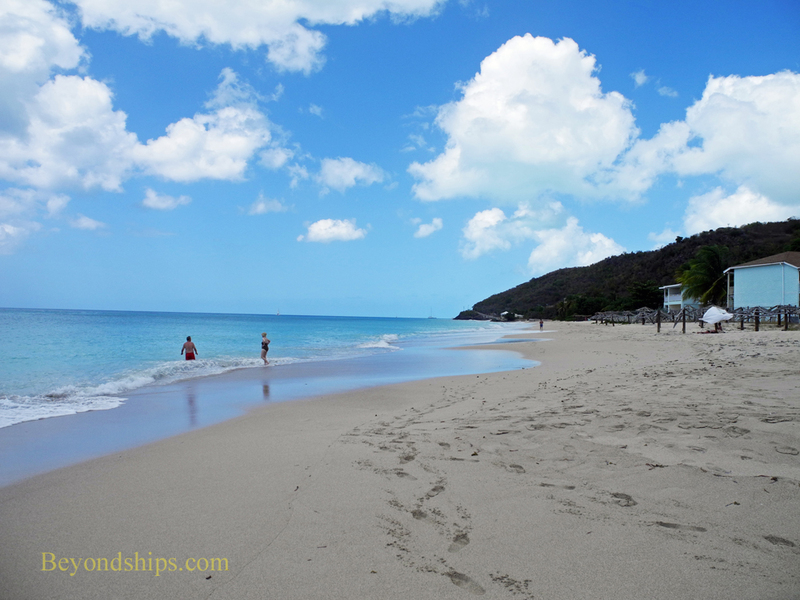 Closer to St. John's on the northwestern coast is Dickensen Bay Beach. With nearby hotels and resorts, it is a very popular venue.